Compás in flamenco refers to the basic rhythmical structure that is the heart of flamenco music. There are a lot of different styles within flamenco music each with its own characteristic compás, harmony and musical motifs. Flamenco has been traditionally taught by using imitation, where students study with their maestro for years to learn and understand each flamenco palo, or style, without the use of written music. In flamenco, the most important quality is compás. To break compás quickly kills the flamenco feeling and is offensive to flamenco aficionados and enthusiasts. Some examples of basic compás for the soleá style of flamenco are shown in the example below. In this style, each musical phrase is generally expected to occupy 12 beats. This 12 beat cycle is considered one compás of soleá, where internally there are accents on beats 3, 6, 8, 10 and 12. The first compás is played using an arpeggio technique and in the second compás rasgueado or flamenco strumming is used to mark the rhythm. 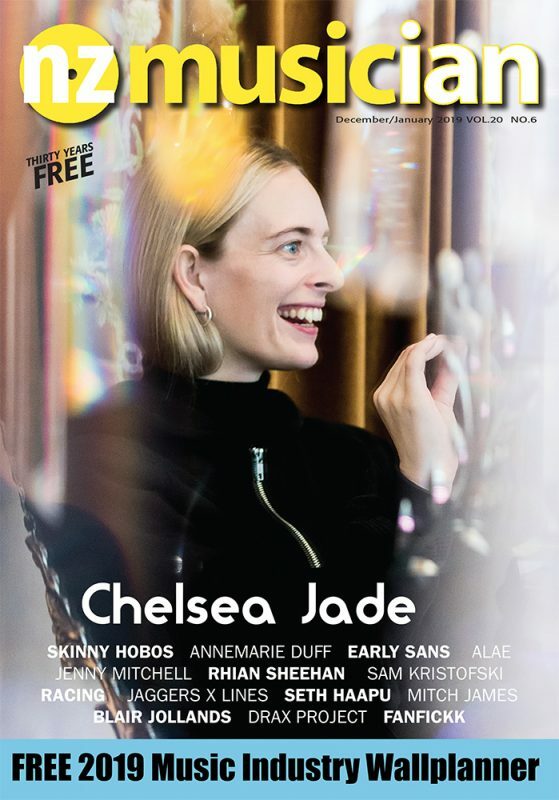 A short remate, or ending, is used on beats 10 to 12 to close each musical idea. There are lots of variations on these remates that you can exchange freely like blocks of Lego to avoid sounding too repetitive. Soleá is traditionally interpreted at a speed of between 70 to 120bpm depending on the personal style of the flamenco player or singer. When practising it’s a good idea to accent with your foot the beats 3, 6, 8, 10 and 12 so that you know where you are in the compás while playing. In bulerías, the same rhythmical and harmonic structure is sped up to around 220 to 240bpm. 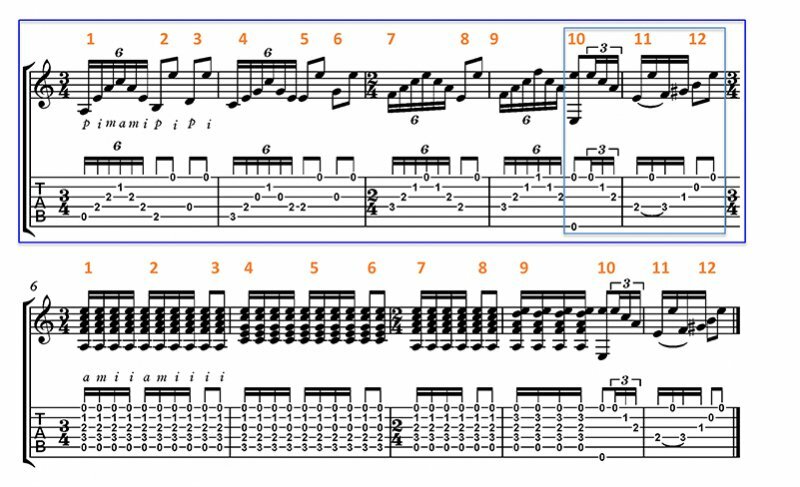 At this speed, the previous example becomes unplayable and different techniques are used to play the flamenco compás and create musical ideas. The next example demonstrates two compás of bulerías. In the first variation, the compás is comprised of two rhythmical ideas both of which are syncopated. Chord changes happen on the accented beats of 3, 6, 8 and 10. Once this basic rhythm has been mastered it is possible to exchange these with other more interesting variations or change chords in other parts of the compás. The second bulerías example is usually played tapado, which means with the strings muted by left hand. This is used when there is a dancer, or to start a bulerías. In this example the rhythmical idea occupies 6 beats and now the compás has a more symmetrical feel. It is often asked why flamenco musicians start playing/counting from beat 12 in bulerías? This is probably to keep things consistent between the soleá and bulerías styles so that internal accents, harmonic changes and closes happen in the same place (beats 3, 6, 8 and 10). It is also common to transition from soleá to bulerías when there is a baile (dance) or at the end of flamenco cante (song), so this helps keep everyone on the same page. Not all flamenco styles use a 12-beat compás, other styles such as Tangos, Tientos and Garrotín use an 8-beat compass, while Seguiriyas has a 12-beat structure with a completely different set of accents. 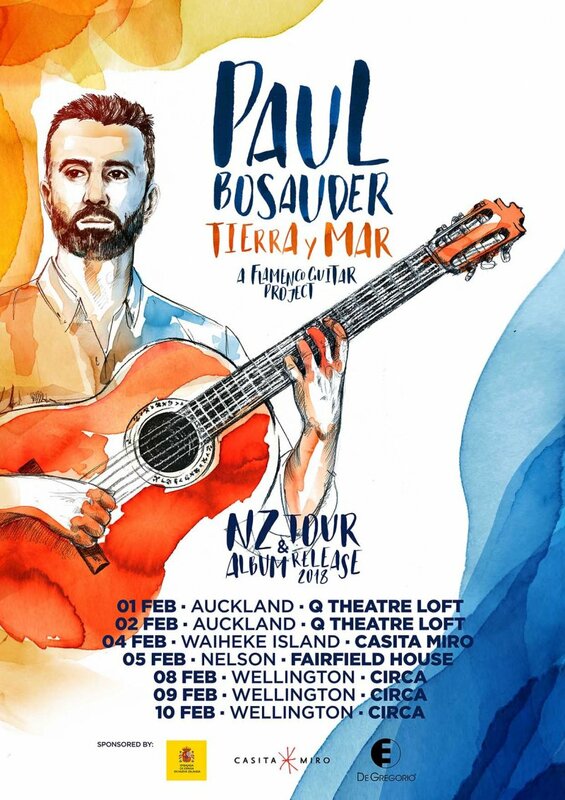 Paul Bosauder is a professional flamenco guitarist based in Seville, Spain. 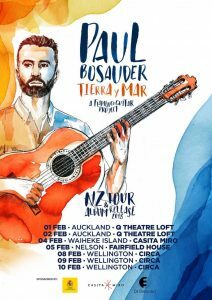 He is currently touring NZ to promote his debut album ´Tierra y Mar´ featuring performances at Q Theatre in Auckland and Circa in Wellington.